Why not practice those Pole Dance moves at home? If you want to dance like a pro, the gym lessons will not be enough. So, go ahead and purchase this Pole Dance Kit for your home now! All metal constructed 45mm (1.96 inch) Pole as used by the professionals and Extendable from 2175mm (85 1/2 inch) to 2745mm (108 7/10 inch) , which makes it far more superior than similar products! - Best Dance Pole offers maximum strength, stability and smoothness. - This Dance Pole Kit includes: 1x Main Pole A(Connect to the base), 1x Main Pole B(Connect to the Dome), 1x Height Adjuster(with 2 flanges), 1x 125mm Extension, 1x 250mm Extension, 1x Height Adjuster Cover, 1x Pole Support Dome, 1x Articulating Base, 1x Adapter for 45mm Pole1 set of Tools. - The Fitness Pole is suitable for dance sport exercise at home and gym, or show in club party pub. 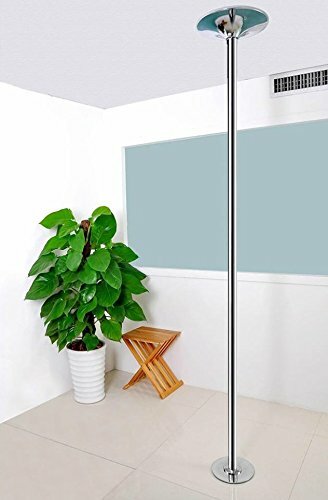 - Every room can be your dancing room with this portable and easy to assemble Dancing Pole Kit. - Now you can dance and exercise in your home at the same time! HOME USE - Suitable for dance sport exercise at home and gym, or show in club party pub. STABILITY - 45mm (1.96 inch) Pole as used by the professionals. Screw together tube high precision joints(almost seamless) for maximum strength, stability and smoothness. Max. load weight: 440lbs. If you have any questions about this product by Kristal, contact us by completing and submitting the form below. If you are looking for a specif part number, please include it with your message.